We’re going to assume that readers know the general background on the millions of “address unknown” NOIs filed with the Copyright Office under a loophole in the Copyright Act (Sec. 115(c)(1)). The Copyright Office then posts these “address unknown” filings one-by-one as part of the public record of the Copyright Office, apparently so that songwriters can find out if their songs are being used. There are no reciprocal countermeasures provided by either the Library of Congress or the Copyright Office. We’ve posted about this process before and Billboard reported on Music Reports, Inc.’s involvement in supporting the entire filing but has yet to report on the scope of the problem. The two key differences between serving an “address unknown” NOI and serving a “regular” NOI is that the “address unknown” NOI is served on the Copyright Office instead of the copyright owner and the digital music service never sends an accounting or a royalty payment. At such time-if ever-that the song copyright owner identifies themselves in the Copyright Office, which the copyright owner is not obligated to do under US law or the Berne Convention, statutory royalties will be payable thereafter–not retroactively. That mess is unlikely to ever get sorted. I’d sum it up by saying that in my view anyone who participates in this mass NOI filing is manipulating a loophole in the law as a way of forcing copyright owners to let their songs be used for free. Rightscorp has developed a proprietary database to assist songwriters with sorting out this mess and we interviewed Rightscorp CEO Christopher Sabec about the process for Music Tech Solutions. Chris Castle: Thanks for participating in our interview today on the “mass NOI” filing. Why don’t you start by telling readers the 10,000 foot view of your resume and what Rightscorp does, especially in the landmark BMG v. Cox case, currently on appeal. Christopher Sabec: I am the co-founder and CEO of Rightscorp, Inc, which is a leading provider of data and analytic services to support artists, songwriters and owners of intellectual property. We assist rights holders by monitoring and monetizing their copyrights on peer-to-peer networks such as BitTorrent. We also provide data and support for DMCA litigation, most recently supporting BMG with gathering evidence, assisting with e-discovery and providing testimony in their groundbreaking litigation against Cox Communications. [BMG won a $25 million damages award against Cox that is currently on appeal.] I am an attorney by training and in the past, I have served as CEO of the Jerry Garcia Estate LLC, discovered and managed the rock band Hanson, and represented Dave Matthews in the early years. Castle: So you’re coming at this from the artist/songwriter/copyright owner side of the desk? Sabec: Correct. We are dedicated to the vision that creative works should be protected economically on the Internet so that the next generation of great music, movies, and other content can be made and creators can prosper. Castle: You’ve had a chance to look at some of these mass NOI filings and that’s what we’re going to focus on today. Let’s start by giving readers an idea of the scope of these filings. How many songs have you identified so far that have been filed with “address unknown” NOIs? Sabec: As of January 18, we have identified more than 25.6 million address unknown NOIs that have been filed with the Copyright Office. Castle: That is a mind-numbing number. How easy is it for any songwriter to search for themselves in these “address unknown” filings to see if the NOIs were even filed correctly since the Copyright Office does nothing? Sabec: It would be a huge manual process. It would require downloading all the individual mass filings, sorting through them to look for particular copyrights, and creating reports that would makes sense of the volume of data. We don’t see this as an easily achieved manual process. Castle: So the Copyright Office has not set up a searchable database for these filings? Sabec: No. The Copyright Office just publishes the filings as they are received, placing the burden of sorting the information on the songwriters and rights holders. Castle: That sounds like the songwriter is effectively not able to find themselves in the Copyright Office filings? Sabec: It’s a true needle-in-a-haystack situation. Castle: When I looked through these filings, I found a number of songs that I recognized that were clearly identifiable and were registered for copyright long ago. Did you find any songs like that when you sampled the NOI filings? Sabec: Yes, we found songs by top artists and songwriters, and verified there are copyrights on-file with the Copyright Office for these works. Examples would be Taylor Swift, Alan Jackson, The Eagles, Disney musicals, many other recognizable and–more importantly–findable song copyright owners. Castle: Which means that those copyrights should not be subject to “address unknown” NOI filings because their address is known. We now receive our data from the United States Copyright Office Public Catalog, as required by Section 115 of the US Copyright Act. If any of the information in the Notice is out of date, then please update your registration with the United States Library of Congress (http://copyright.gov). For more information on compulsory licenses, please visit: http://www.copyright.gov/circs/circ73.pdf. The most immediate problem with this approach is that the Copyright Office Public Catalog clearly states that it only covers titles that were registered after 1978. Pre-78 titles are on paper records at the Copyright Office. Did you find any pre-78 songs in your sampling of the “address unknown” data? Sabec: Yes, we found very well known songs from well known artists from the pre-1978 period. We also found songs from the pre-1978 period that have filed renewal registrations available in the Copyright Office Public Search Catalog. Castle: That’s odd because the Copyright Office puts users of their catalog search on notice that it only covers post-78 titles, as does the Library of Congress which sells this information out the back door for big fees. 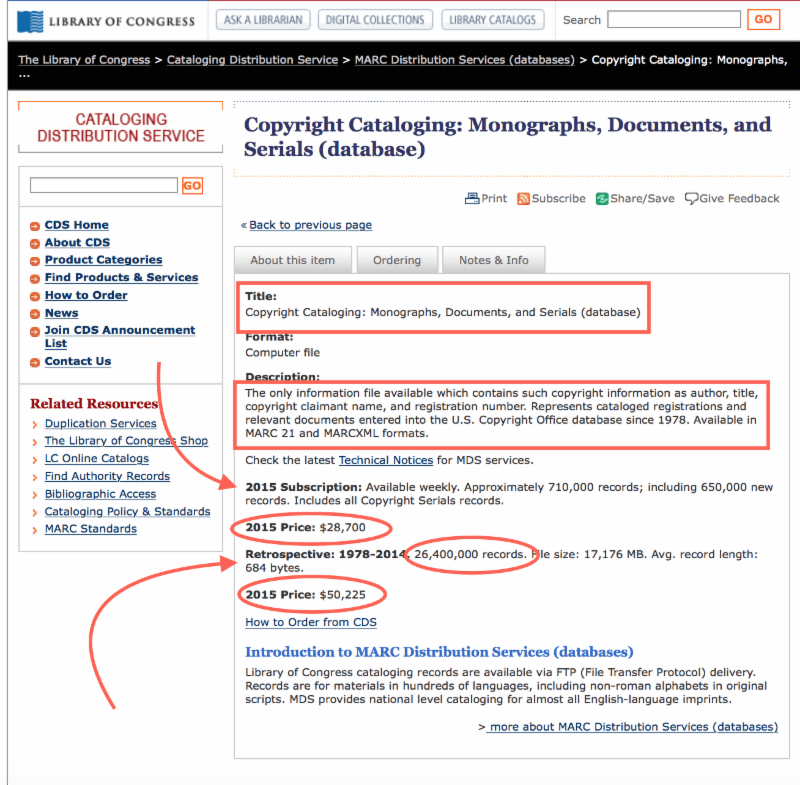 Have you been able to afford the tens of thousands of dollars to purchase the Library of Congress database of copyright registrations and recordation to compare what’s been registered to what’s in the “address unknown” filings? Sabec: No, we have not purchased the database. Castle: So it doesn’t appear that Google, Amazon or Pandora are doing anything in the way of searching the card catalog or using the many other resources available to it to find, say, The Beatles, The Rolling Stones, Garth Brooks, or Alan Jackson, not to mention songs from the pre-78 period? Sabec: No, it does not. And it makes no sense. We are cross referencing the NOIs and using the available Public Search Catalog to determine that many of these “address unknown” NOIs should not have been filed in the first place. Many owners are known and easily identifiable in the Public Records. Castle: What can the average songwriter do to find out if they’ve been forced into getting involved in this entire debacle? Sabec: This is a daunting task. It takes a lot of time and energy, and is a very expensive undertaking. Rightscorp are investing the time, energy, and money to solve this debacle and we intend to offer songwriters and rights-holders appropriate solutions. Castle: It sounds like you’re collecting the data that would allow you to be in the same position as whoever is filing all these “address unknown” NOIs. Given that you have that data, what’s the next move for Rightscorp on these mass NOIs? Castle: Thanks for participating today, Christopher, please keep us informed of your next moves.